Dewey II ocean block cottage now has a mini split air conditioner/heater in the kitchen! The cottage includes a full kitchen with granite counter tops, stainless steel refrigerator, dishwasher and microwave, natural maple cabinets, granite breakfast bar and track lights, white open beam ceiling. Flat screen TV (43Inch) offers rainy day entertainment as well as wireless Internet. 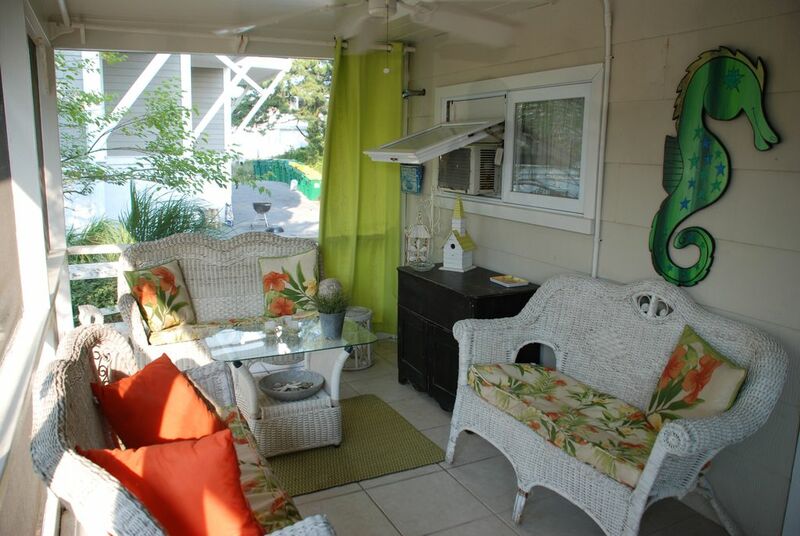 Enjoy the beautiful screened-in porch for ocean breezes with your morning coffee or cocktails at sunset. Ceiling fans provide a breeze inside, along with air conditioning, for added comfort. The cottage has three off-street, tandem style parking spaces- a real bonus since parking in Dewey is at a premium. Dewey II is just steps from the beach/ocean and all Dewey has to offer---restaurants, shops, entertainment; the best of all worlds in a quiet cluster of cottages. Responsible adults only-- we love our place and hope you will too! Dewey II has a queen size bed in one bedroom, 2 twin beds in second bedroom. You can also enjoy ocean peek views from one of the bedrooms and brand new bath. One dog $150 per week or $25 per night. Two dogs $200 per week or $40 per night. Did you know that Dewey Beach received a five-star beach rating from the Natural Resources Defense Council. Dewey was one of 12 beaches in the country to be given a five-star rating, and the only one in Delaware for cleanest water. No smoking inside the cottage. No large groups-- comfortable for 4 adults. This is a small cluster of cottages and duplexes with families and kids, so no loud parties. We want you to enjoy your stay in Dewey, but please respect the neighbors too. Cancellation and Rental Insurance available through VRBO site. NOTE: We "NEVER" advertise on Craig's List; any advertisement there for this cottage is a scam. This is the perfect little beach cottage. Its so close to the beach--you can hear the waves! Dewey Brewing Company, Woody's, and the Starboard are right down the street. Baseboard heat in bedrooms. Mini split unit for living room. Kitchen island seats 6. Table on front porch seats 4. This little cottage was a perfect beach getaway! It was clean, cute, and the perfect size for us - 2 humans and a 40 pound dog. The location is incredibly convenient, we barely moved our car once we arrived. Each morning (as well as afternoon & evening!) we walked the few steps to the beach so our pup could run around, play with all the other beach dogs, and get lots of love from their humans. For meals, we walked a few steps in the other direction and had lots of great choices. Dewey II is becoming our home away from home. A cozy and quiet cottage that's steps away from the beach and Dewey happenings. This is our second year at this cottage. We appreciate the location, well-equipped kitchen, cleanliness, cute décor, and coziness of the cottage. We enjoyed the upgrade to the tv! Thank you, Paula, for your quick responses to questions and for your hospitality! We look forward to another visit! Thanks for your nice review! Hope to have you next year. The cottage was comfortable and had everything we needed for a wonderful weekend. Our senior dogs had no trouble getting to the beach access. My husband and I appreciated that there is so much within walking distance. So glad everything worked out for you and your dogs!!! I think the walkability in Dewey is a real asset. My mother, dogs and I stayed in Dewey II in October. It was my second stay this fall, my favorite time at the beach. The location of the home is excellent - so close to the beach. The screened porch has a nice breeze and is perfect for morning coffee and afternoon wine. Inside, the home has an updated kitchen two comfortable bedrooms and a large living space. I will be back again! Rates listed are estimates and are subject to change. Two payments are available for some weekly-monthly rentals upon request. Pet fee is $25 per night per dog or $150 per week for 1 dog/$200 total per week for two dogs. Limit is two. Manager will add pet fee to quote upon booking--no cats allowed due to allergies. Prefer e-check to credit card but accept both.